Mount Auburn Cemetery, Cambridge, Mass. Mount Auburn, founded in 1831, is considered the nation’s first “park” cemetery. Photo from collection of Mount Auburn Cemetery Archives. Growing up, I was surrounded by death, but I saw much beauty, too. I’ve always been a visual person. Even before I could read, I was entranced by photographs. I would stare at old family pictures or illustrations in books. At cemeteries, the gravestones and flowers were so artful to me. I responded to shapes and colors. I appreciated the physical layout of cemeteries—the neat, grid-like rows of gravestones, the square sections of grass separated by gravel roads. 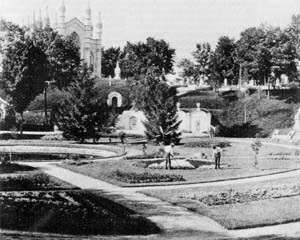 Woodville, Waseca’s city cemetery, was the only one in the area laid out in the “park” format popular with large cemeteries in the late 19th century. These cemeteries were designed with the same intent that would later become apparent in Central Park in New York city, with meandering roads and lots of rounded corners instead of strict grid patterns. It was hoped that this layout would make cemeteries inviting. Indeed, in the late 19th or early 20th centuries, it wasn’t uncommon to find families spending entire afternoons in cemeteries, strolling around or sitting down with a picnic lunch. Since I appreciated the beauty of cemeteries, it was a natural extension that I would see Dad as an artist. He didn’t look like my vision of an artist, which was an Andy Warhol-type wearing a black turtleneck and fashionable glasses. But still, he paid attention to his work much as a painter spends time creating just the right brushstroke, or just as a writer takes the time to craft a lyric sentence. Dad expertly carved the walls of a grave, making them straight and exact. After the grave was closed, he made sure the sod on top matched perfectly to the grass around it. Like a seamstress, he matched the edges and pulled them together, ensuring no gaps of dirt were exposed. I think Dad, too, saw his job as art. He took his work seriously and wanted people to see that he did a good job. I think even workers in traditionally non-creative fields need to employ creativity. There are always creative or artful ways to approach any job. And we can find beauty in the most unexpected places. LOL! I didn’t write it, but I agree with it! There’s nothing wrong with playing in cemeteries, but you’d think kids would be taught to not take things or mess with things. I never witnessed this kind of behavior in cemeteries. I’m guessing really large cemeteries in large population centers maybe have more of a problem with it than small-town cemeteries, which generally get relatively few visitors. A friend in college grew up near a cemetery, and her father was the “artist” who chiseled the headstones and carved the verses and likeness of angels on the interior walls of the family mausoleums. When I visited her one week between semesters, vandals had done horrible damage to the children’s cemetery, and as we helped clean up, her anger and tears were palpable. Even now, years later, if I need to imagine careless damage and anger, I visit local old cemeteries and relive that week and my friend’s passionate protection of final resting places. I would like to meet this friend! I totally get where she’s coming from.